I was pretty taken in the dead of summer 2011 when Horrible Bosses showed up and gave us an original comedy that delivered moreso than the comedy sequel we'd been waiting on that year, The Hangover Part II. There was just something about the ensemble cast, the films carefree tone and slapstick roots that meshed brilliantly with the chemistry the three leads were able to pull together. In short, it became one of those comedies I could watch over and over again once it hit home video. In the days of short attention spans and legacies that never last though, if one wants to remain relevant they must continue to deliver and so this year, when we've already had both a successful original comedy (Neighbors) and a successful sequel to a comedy (22 Jump Street) it feels we're a bit spoiled by the fact we get another high profile comedy sequel, but unfortunately it also feels (at least on first impression) totally unnecessary. Don't get me wrong, like The Hangover trilogy, I wouldn't mind watching another one of these movies simply as an excuse to hang out with the leads, but the first film was such a solid single entry it seemed making a follow-up with the same characters having just as wild an experience would do nothing but devalue the memory of the first film. As is typically the case though, this new trailer for the film makes our boys look qualified for a comeback as kidnappers rather than murderers in pretty funny fashion. Horrible Bosses 2 stars Jason Bateman, Jason Sudeikis, Charlie Day, Jennifer Aniston, Jamie Foxx, Christoph Waltz, Chris Pine, Kevin Spacey and opens November 26th. Check out both the new trailer and poster after the jump. 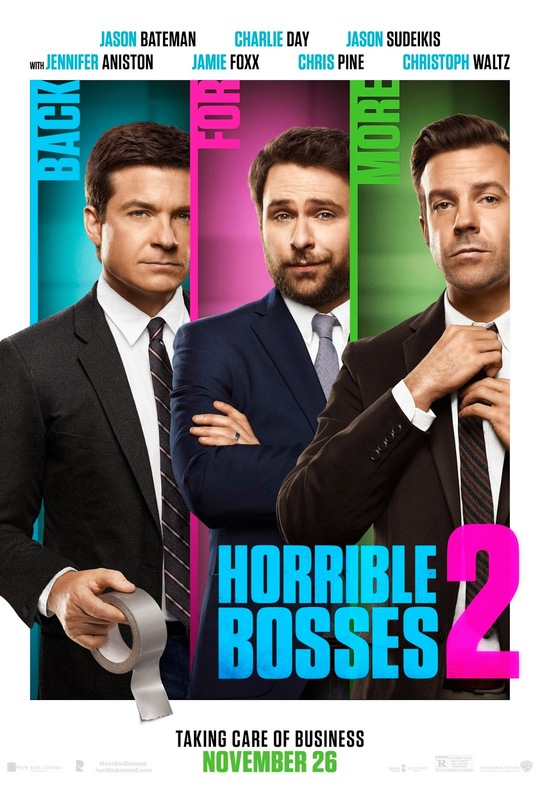 Synopsis: Fed up with answering to higher-ups, Nick, Dale and Kurt decide to become their own bosses by launching their own business in “Horrible Bosses 2.” But a slick investor soon pulls the rug out from under them. Outplayed and desperate, and with no legal recourse, the three would-be entrepreneurs hatch a misguided plan to kidnap the investor’s adult son and ransom him to regain control of their company.